Gamrie-based poet Ian Crockatt's latest book Skald, published by Koo Press, has been described as "stunning", and the use of language as "riveting". 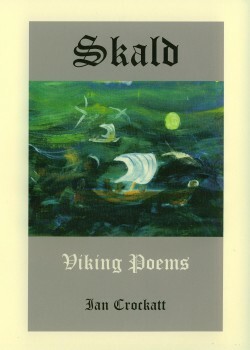 Skald is a feisty series of 30 poems written in a form developed by Viking court poets. Come and hear it for yourself at the Salmon Bothy. It has already been stated that Ian Crockatt should be merited a gold star for his use of language. And few who read this stunning work will think otherwise. The Skalds were professional poets employed by the kings of the Viking courts between the 9th and 13th centuries, in essence recording glorious victories and fallen heroes that would in turn become legends. However, from such a ragged existence uniformity is the name of the game here, and in these octets with their six syllable lines, the lively narrative, be it brutal or tender, lifts these words from the page. Disturbing. Vivid. Tender. For the full impact of these poems, though, pick up this book, pace the floor and read it out aloud! 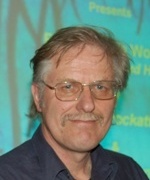 Ian Crockatt has published 5 collections of poetry to date, the last two being Blizzards of the Inner Eye (Peterloo Poets, 2003) and The Lyrical Beast (CD, Salix Publications, 2004). He was assisted in work on the latter, and production of the CD, by a Scottish Arts Council bursary and a Banff and Buchan Arts Forum grant. Original Myths, (Cruachan Publications, 2001), with etchings by Paul Fleming, was short-listed for the Saltire Society's Scottish Book of the Year Award. He is currently working on a selection of translations of Rilke's poetry with a view to publication by ARC Publications, and with the support of a second Scottish Arts Council bursary. He lives on a croft in North Aberdeenshire with his wife Wenna, who is a ceramic artist and Adult Learning Co-ordinator.